It’s one thing to have a feel for flavor combinations, it’s another to have a true passion for ingredients. That’s the feeling we got during our recent lunch at Beverly’s Soma—as though someone had lovingly hand selected each ingredient and combined them in the best way possible. Indeed, the Web site says quality ingredients (local when possible), creativity, and attention to detail are what the restaurant is all about. We began with a wonderful appetizer of braised lamb and gnocchi ($9). The lamb was tender, the gnocchi were incredibly light, and they were both bathed in a rich sauce along with spinach and mushrooms. Our entrees were equally satisfying. The fresh mozzarella and prosciutto panini ($8) was lightly crisped so as not to melt the thick slice of cheese and accompanied by wafer thin slices of prosciutto and very flavorful black olive tapenade. We picked cole slaw rather than fries, and it was great (freshly made with a dash of curry), but the fries we saw going by looked worth a try. 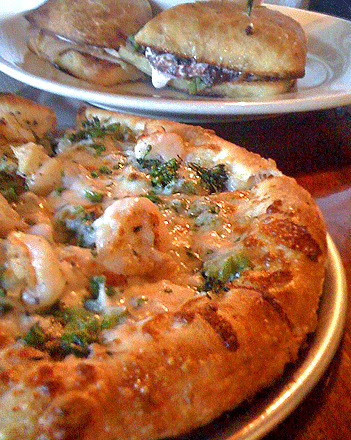 The garlic shrimp pizza ($9) had an abundance of toppings, including crisp/tender broccolini, on a marvelous crust—crispy and not too dense. We shouldn’t have, but we had to try the Aphrodite chocolate cake, which came with vanilla bean ice cream and salted caramel sauce. Much lighter than the typical molten cake, it was rich, meltingly tender, and not too sweet. A bite of cake with the sauce and ice cream put us in dessert heaven. 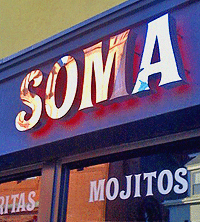 If you’re looking for a relaxing lunch spot with top-notch food, Soma should be at the top of your list. The service was superb, and the menu is varied enough to please just about any craving, including a large wine selection and the option to build your own pizza from a list of 41 ingredients.